Imagine you are enjoying a nap under the warm Caribbean sun. 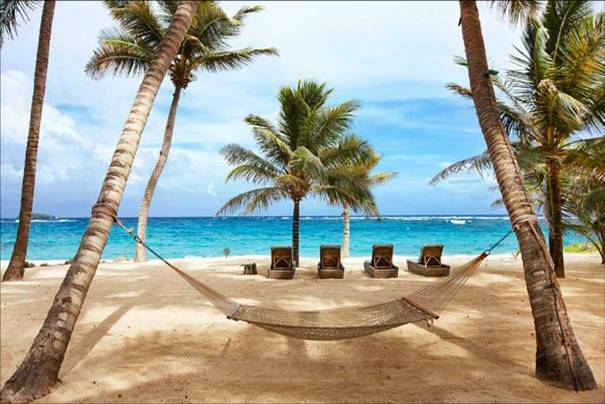 You are gently wrapped in hammock tied tightly between two beautiful palm trees. The palms of the tree offer you the perfect amount of shade allowing your eyes to rest peacefully. As you dreamily sway, you are cooled by the easterly sea breezes bringing you to a perfectly balanced temperature. The sound of the crashing waves allows you to enter into a tranquil state. You are amongst the cam and beauty of Mustique and life couldn’t be better! Sink into a hammock at Villa Sunrise! Villa Sunrise is a five bedroom spectacular new villa that sits on its own secluded beach in Mustique. A short stroll to the world-famous Macaroni Beach and the wild, beautiful Pasture Bay, guests at this luxurious residence will be perched high on the hillside to enjoy panoramic views of the ocean and coconut grove. The villa features numerous dining and relaxing terraces, media room and professionally designed gym to ensure that the guest’s comforts have been well taken into consideration. Additionally, an infinity pool, floodlit tennis court and pavilion are ideal for those who wish to stay active while on holiday. Villa Sunrise offers the greatest of amenities allowing for a relaxing and unforgettable Mustique Vacation.